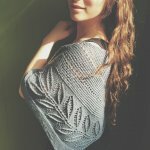 Drapey, worsted weight, hand dyed yarn comes together beautifully in this magnificently cabled masterpiece of a shawl. Amy Herzog's custom fit program produces a custom pattern specifically engineered to fit your exact measurements with stitch counts that work with your gauge. In honor of Local Yarn Store Day, cast on this light weight gauzy confection of mohair, silk and wool, is an absolute joy to knit and to wear. This crochet stitch sampler tackles everything from lace to cables. It's bound to keep you interested. Learn the basics of crochet in this three week class! In this three session course, students will learn to knit and purl in the round completing a beautiful cowl. This is a wonderfully fun and gentle introduction to knitting. 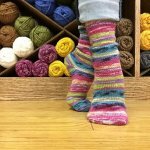 In this three week beginner knitting course you'll learn way more than the basics. This Gudrun Johnson shawl is worked up in a riot of colors with a woolen spun yarn, and promises to become an heirloom. My favorite part was the complete and utter lack of purls! Drapey linen mesh and generous ease come together to create this dreamy top. Constructed like a shawl, this sweater's construction will keep you endlessly entertained! Another show stopper worked with Stonehege Crazy yarn. This fun filled adventure takes you on a journey of color. Wrap yourself up in this sport weight beauty this spring. Toe up, two at a time, and an afterthought heel. This is the best and only way to make socks in my opinion. Malabrigo Rios sings in this crochet beauty that focuses on chart reading.